The opportunity for amateurs to show their work alongside some of the most celebrated names from the art world is what makes the Royal Academy's Summer Exhibition an enduring fascination. Now in its 246th year, it features work created in a variety of media, including painting, sculpture, photography, printmaking, architecture and film. This year more than 12,000 artists submitted their work for consideration, whittled down to just over a thousand for the final display. 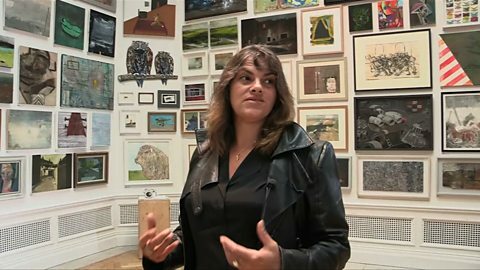 Royal Academician and Turner Prize nominee Tracey Emin, whose own painting features in this year's show, takes us on a tour of the small works room to highlight some of her favourites. Amongst the varied collection are complementary watercolours of Sherlock actors Benedict Cumberbatch and Martin Freeman painted by their co-star Una Stubbs. Tracey Emin was born in Croydon and raised in the seaside town of Margate. Her first solo show was held in London's White Cube Gallery in 1993. Emin's controversial works including a tent embroidered with the names of her sexual partners and My Bed (1999) cemented her fame. The artist's association with the Royal Academy began in 2001 when she was first invited to show work at the Summer Exhibition, a feat repeated on a further five occasions. In 2007 Emin was elected as a Royal Academician and from 2011-13 served as Professor of Drawing at the Royal Academy Schools. She was appointed a CBE in the 2013 New Year Honours List.